Chris left you guys in Chiang Mai. Our trip to the flying Gibbon was extremely fun, but for the following day we decided to do something touristy and visit Wat Doi Suthep- "the temple on the hill" which is meant to offer you amazing views of Chiang Mai and is a stunning temple. I visited it there on my last trip, which was a lot more successful than the one we perused on this particular day. Our day started with a trip in a large red van to the bus station to try and purchase a ticket to Sukhothai. However, when we got there the tickets were very expensive so we decided to go back into the town centre and get them from a travel agent (who we later discovered ripped us off!) After our pointless trip to the bus station we got into another tuk tuk which took us to the bottom of this hill this temple is meant to be on. We were expecting a tram to be at the bottom of this hill which we could catch up to the temple - the tram wasn't there. Instead another man was trying to rip us off by trying to make us wait in the scorching heat to wait for another 8 people in order to take the big red trucks up to Doi Suthep. Needless to say, we were having none of it, we tried hailing a red truck to take us up, but they were also trying to rip us- so we took yet another tuk tuk back to the town - was such a pointless day! Hour one:get on the "VIP" bus (it was defo not VIP!) Bus gets packed and lots of people standing in the corridor of the bus. Hour two: police check. A policeman walks onto the bus, looks around for about four seconds and then gets off the bus. excellent service. Hour three - four: Stop at a 'mysterious meat' stall. Decide to not taste mysterious meat and get back on the bus thinking we only had an hour left. Hour four: ask the staff what time we were meant to be at Sukhothai. Her reply: 4pm. Another three hours left. Hour five: sulking and hungry. Should have gone for the mysterious meat. Hour six: try to sleep. Hour seven: FINALLY arrive in Sukhothai! After a loooooong journey, we finally get to our nice hostel and chill there for the afternoon. We cycled (yes! I cycled!) into the town centre and discover that new sukhothai has not a lot to offer, and cycle back. Whilst chilling at the hostel another guest comes back from cycling back from town and is complaining that a dog bit him on his way back to the hostel! So we all tell him he should really get it checked out, as he had no rabies jabs before he went! This incident make us a little weary of the dogs down the lane! The same night I seemed to be attacked by bugs that left me with blistering on my ankles and a slightly swollen calf (mmm my leg looked p-retty!). Also, the hostel cat, Peter decides to go out hunting. This cat was the biggest cat I've ever seen. He was huge. He also bought back with him a live mouse, which he then proceeded to kill in front of us so we could hear the mouse scream. This was followed by the thai receptionist exclaim a scream and a shout in Thai involving the word Peter! With this, Chris turns to me and say: "I think that's Thai for Peter's eaten a mouse". Thanks Chris. The day after I wasn't feeling very well, so instead of cycling in 36 degree heat we decided to take a moped! The town was about 10KM from our hostel, Chris decided he would take the moped out for a practice, which I can confirm did NOT increase my confidence in him driving the moped. However, as a trusting girlfriend I jumped on the back and gripped on tightly. However, his confidence grew and he got a lot better! The trip around the park was amazing, it was so beautiful, but very hot! Our moped was a welcome breeze around the park! The day after was our trip to Bangkok on a really cool VIP bus! It was like a plane, except with better leg room! We were given food and drinks, it was great! 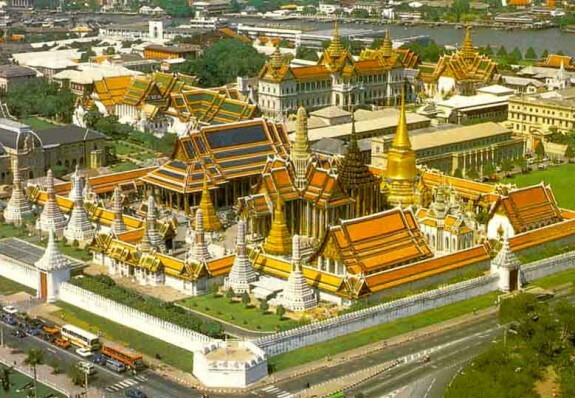 Which leads us to our activities in Bangkok, we have been visiting the sights! Our first day was the Grand Palace where locals tried to rip us off once again, except we figured out what they were doing! It was SO hot at the grand palace. This was also not helped by the fact that we both were wearing inappropriate dress and had to cover up! This involved stunning bright blue tie waist trousers for Chris and a huge light blue shirt and sarong skirt for myself. We took pics, I'll try and put them up soon! After this we visited Wat Po, where they is a huge reclining Buddha which was stunning. Yesterday involved a trip to Jim Thompson's house which was really interesting. Jim was an American who visited Thailand and fell in love with it. He began a silk workshop and designed his own house in Bangkok. However, in the later sixties he went missing in the Cameron Highlands (in Malaysia where we had previously visited) never to be seen again or any evidence showing what happened to him! His house was stunning and was a different place to visit in the big city of Bangkok! After this we visited MBk , which is an impossibly big shopping centre full of fakes, that's more like Bangkok! So, all in all our trip to Bangkok has been a varied one. Unfortunately today the red shirt protests have altered our day, so we've come back to chill at the house. It's interesting being here with the protests, more like a carnival atmosphere rather than angry (they are never violent!) Its just annoying as they stopped some of the train lines going into the city because of the disruption! In the next couple of days we head to the islands and then onto Hong Kong.